I'm camped along the Wenatchee River, nigh on to twenty miles west of Leavenworth Washington, only three miles above a place called Coles Corner. That town of Leavenworth is a place that seems like it was built for tourism. The whole town, even McDonalds! has been built to echo a Swiss Alps town. You'll likely need to keep your sunglasses on for all the flowers. Even on a cloudy day the colors just pop.. everywhere you look. Flowers everywhere. Hanging baskets, window boxes, beds of 'em, great pots of 'em... If you like color and flowers... You'll like this lil' burg. When you get hungry or thirsty and go looking for a place to eat or sip a brew, you've picked out a job for yourself. You might could go bankrupt trying to sample every eatery or beer in this place...If you lived here a month and ate each meal in a new place, I'm not sure you could cover 'em all. 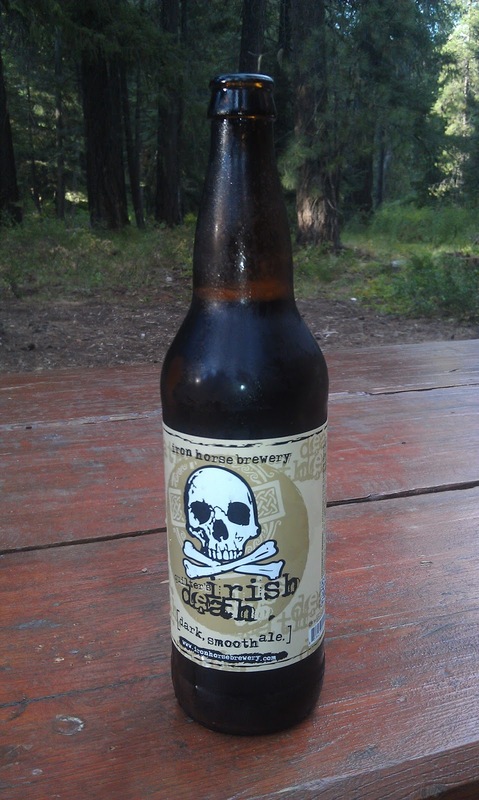 Quilters Irish Death Ale brewed up by the Iron Horse Brewery in Ellensburg, Washington. Aw, it just has a ring to it... don't it? WHooooooeee! Now that might LOOK like a reg'lar bottle of brew but that big baby's a pint and a bit of Suh-Wheet smooth Ale! That record of no disappointments held true with this lil' beauty too! and I gotta tell ya... that 7.8% kinda caught me off guard at the end of a warm day! :) caught me off guard and caught up with me! I may just be getting to be a lightweight in my "golden" years. The other local brew I've been sippin' that hasn't hurt my feelings any is the Whistling Pig Hefeweizen that's bottled up by Fish Brewing Co. out of Olympia. I started drinking the Hefeweizen style beers down in Mammoth lakes... and I gotta say, I like it! With the temps bangin' on and into the 90's round here, an old guy has to take good care to stay hydrated and cooled down sufficient from the riding! I'm not any sort of a Beer Conna-sewer... I don't know about hoppy, or smooth or any of the lingo of any of that stuff... other than that IPA makes me gag! Yes sir, medicinal alcohol judged to be Cowboy Biker Excellency'! But... the real deal here, for me is the roads that take me from here to there and back again. There's two of 'em and two lanes both. The first is the western segment of U.S. Hwy 2, the main route, that runs from St. Ignace Michigan to Everett Washington... and winds right through the river valley that holds Leavenworth. If you turn off onto Washington 207 at Coles Corner you'll find our forest service camp just a couple of miles up... Leaving that camp and turning away from Hwy 2, just a few hundred feet is the "back" road that will take you to Leavenworth, 18 or twenty miles distant, by way of Plain, Washington. Now, I'm here to tell you that on a mid morning ride on a sunny Tuesday morning... It was one of those rides that I can only describe as Suh-Wheet. Traffic was light. I got stopped for about two minutes at a repaving project but other than that it was one of those perfect, little traffic, no brakes, just wind it up tight and let the motor pull her down into the mostly fast sweeping bends. A tighter twist here and there tickles your attention, but mostly it's that sweet dance where my rumbling machine can just roll from leaning over left, stand up quick, roll right through straight up and dance right back into a right hander. Back and forth, one sweeping turn after the other. The tighter ones coming in here and there to keep you honest. Faster than legal for sure. ;) but still not that crazy, spine tingling scream when you hear a crotch rocket wound up tight. This road lets me make that smooth, choreographed dance where everything fits into place and it's like a piece of music you can't get out of your head... You just sweep along and hope you never get there. I don't push cagers when I come up on 'em... no profit in it... I just hang back and wait for an opportunity to roll by safe and easy... this day, two of 'em just pulled over in a wide spot to let me roll on... even though I was back there a decent space and riding easy... I coulda kissed 'em. suh-wheet! I picked up our mail at the post office, fueled the scooter, and then made the return ride west up Hwy 2 back to Coles corner. Much of that you run along the river with views of it and the surrounding hills as you split the wind in a gorgeous valley. Be lucky like me and you find yourself in a big hole between the traffic that was light anyway... and the main road return is nearly as sweet as that joyous back road. Yeah... stay in Leavenworth for a night or two. Taste the brews and the food. 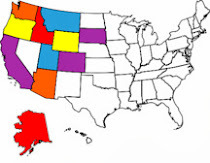 Ogle the purty gurls (California has NOTHING on Washington!!!) and make the loop out through Plain and back. So glad you are enjoying the Pacific Northwest. I have heard many a good things about Leavenworth but we've never been there. Just might have to change that. I have never acquired a taste for beer, but have been enjoying hard cider lately.